We can repair or replace all your motorcycle locks including ignition locks as well as cut new keys for you. Need a spare set of keys for your motorcycle? Looking for a motorcycle locksmith who can replace your motorcycle key, fix your damaged ignition, or even rekey your gas cap lock, brake lock, or saddlebag locks? No matter what type of bike you own, how old it is, or what type of customizations you’ve had done, our fully licensed, registered and insured motorcycle locksmith has the skills and specialized equipment it takes to replace your motorcycle key, rekey your brake lock, and even install a new motorcycle ignition switch. We work on cruisers, road bikes, dirt bikes, and motocross bikes, including Harley Davidson, Honda, Suzuki, BMW, and Ducati. We can also cut keys and repair ignitions on off-road motorcycles and ATV’s. Few things are more frustrating than losing the keys to your ride, but before you call for a tow to your local motorcycle mechanic, call us here at Lightning Locksmith. Our certified, registered and insured mobile locksmith has the specialized skills and equipment it takes to rekey motorcycle ignitions so new keys can be cut for your bike. 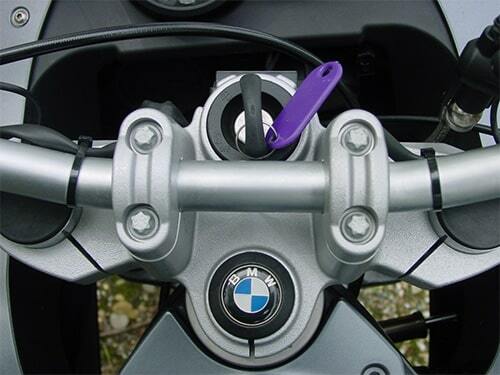 If you happen to have the key code tag that the manufacturer supplied with your motorcycle we can use that to create a new set of keys for your existing ignition, however, if you can’t find that tag, we can rekey your ignition and gas cap lock for you. And because we’re a fully mobile locksmith company, we’ll come to wherever your bike is located within Delaware County, PA, saving you the cost and hassle of having your motorcycle transported to a shop for service. As the exclusive provider of mobile locksmith services throughout Delaware County, we help motorcycle riders in Wayne, Brookhaven, Newtown Square, and the surrounding areas get back on the road as quickly as possible. Whether you need us to repair your motorcycle ignition, rekey your motorcycle, or supply you with a new gas cap lock and key, you can rest assured we’ll provide you with fair, honest pricing and quality service, guaranteed. Don’t let a lost key, glitchy ignition switch, or seized gas cap lock keep you from enjoying your ride – call us today at Lightning Locksmith to book an appointment with our motorcycle locksmith.